Never underestimate the power of play for your indoor cat: Cats not only need but enjoy regular play sessions. Just don’t expect your Persian to revel in a game of fetch, and forget trying to engage your Siamese in a friendly game of tug-of-war. What games do cats enjoy the most? Ones that harness the true hunter inside them, says Joan Miller, a veteran all-breed cat judge and vice president of Cat Fanciers’ Association, the world’s largest registry of cat breeds. So how do you play with your cat? Miller identifies four feline-preferred game styles: bird, pounce, rabbit and hide-and-seek. 1. Bird Games: These games involve waving feather wand toys or other cat toys that require your cat to leap in the air and try to capture the flying object in her front paws. Select a safe, spacious area of your home so that your cat does not fly into any furniture. 2. Pounce Games: To play pounce properly, provide your cat with a way to be able to leap on an object moving on the ground. Create a target by moving your fingers under a bedspread or a throw blanket on the sofa. “Many cats seem to appear whenever you try to put on fresh sheets on your bed — you want to make the bed, but they see this as a great opportunity to play,” says Miller. 3. Rabbit Games: These games bring out a cat’s natural instinct to pull a toy into her belly while on her back, kick with her back legs and shake and bite a toy prey. Catnip-filled toy mice and lightweight fur toys with feathers are popular choices. You toss the toy across the floor for your cat to grab and deliver a few punches with her back legs. 4. 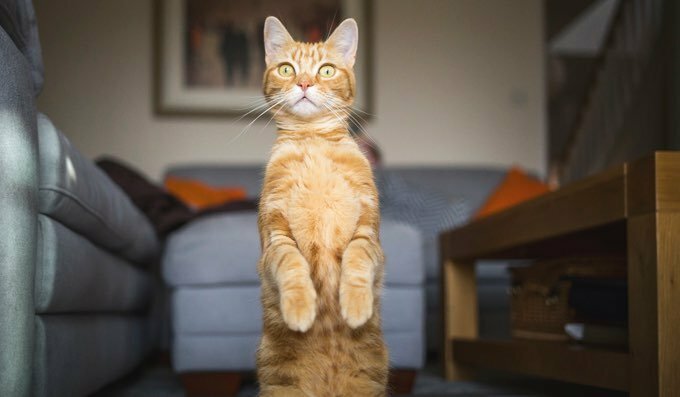 Hide-and-Seek Games: These exercises unleash the predatory nature in cats, many of whom delight in the ability to hide and wait for their prey. That explains why your cat may hide under a skirted table or under your bed, and then spring out and make a surprise attack on your feet. Ouch! Save your toes by flushing your cat from her hiding spot by tossing a paper wad or cat toy for her to attack. Still, Miller urges cat owners to spend five to 10 minutes a day in purposeful play with their feline companions. The benefits are many: Not only will you keep your cat mentally sharp and at a healthy weight, but you can possibly save your sofa from being shredded, or eliminate a host of other unwanted feline behaviors.